Editor’s note: We’re welcoming Hayley back for a guest post! Check out all her previous work on the blog from when she was a student. I have learned a lot of things in my first year in grad school. I expected to learn standard course material and major information you need to have before you move into your chosen profession. I didn’t expect to learn so much about what it is really like to be surrounded by people who share your passion; something I imagine is similar to what it will be like in the real world. The people in my program all want to be school counselors and, naturally, when you narrow down the field like that you end up with people who share common interests and beliefs. I think this is something I should have expected but having never experienced something like this I had no idea what to expect or how to prepare for it. It kind of caught me off guard, in a good way. Being surrounded by people who are so much like yourself gives you the opportunity to truly be yourself and to grow as professionals together. I have made some great friends in my first year and will be entering my internships in the fall knowing that there are people supporting me and going through the same thing I am. I know once we graduate I will have a network of professionals who I can count on. I have also learned more about myself in one year of grad school than in all four years of my undergrad. I am growing into the adult I would like to be and getting to know my adult self. Along with all of this growth there have been a lot of growing pains. I have become a stronger, more confident person and as a result of this, failures are becoming more difficult. I am putting in a great deal of effort to build up my own self confidence and self esteem but it becomes hard to do that when you are passed over for jobs or when you struggle to find internship sites. However, that network of future professionals in my cohort are there to encourage and support me through all of this. Grad school so far has been an amazing experience. It has been one of the toughest things I have ever done and I’m sure the tough part is just beginning, but if I could go back I would do it all over again. Editor’s Note: Over the next few weeks we’ll be saying goodbye to several of our authors as they are graduating from UMD. Please feel free to wish them well on their future endeavors in the comments! So, it is finally over. When I first started college here at UMD I never thought I would actually finish; but here I am, the only thing that stands between my diploma and me now are my finals. In less than a week I will walk across that stage as they read my name and officially become an alumni of The University of Minnesota Duluth. I cannot believe just how fast it all went. There were classes that I hated and ones that I loved. I met people who I will never forget and some that I wish I hadn’t met at all, and worked with some of the best faculty and staff ever. I came to UMD on my own and a ways away from my family with the simple goal of graduating and have ended up with so many friends and connections that I wish I could take them all with me wherever I go. I wish I didn’t have to leave but it is time for me to start the next adventure in my life. This is definitely one of those bittersweet moments for me; I am excited to go on to grad school and see what my program and the new school have to offer me but I don’t want to leave all of this behind. I do, however, want to become a school counselor and in order to do that I need to move on. I will always love UMD and I can’t even imagine myself anywhere else but it’s time for me to go. So enough of my sappiness, I hope that you all have the same kind of experience at your undergrad institution that I did. Enjoy it while it lasts! For this blog post I decided to write about an article I read online. The article was “5 Jobs You’ll Have Before You Find Your Calling” by Glassdoor. The five jobs according to this article are; the job that gets your foot in the door, the job that provides you with connections, the job where you were promoted, the job you hate, and the job you love but quit for something better. I think this is a great look at the jobs that you often end up in. The article focuses on what I see important about these jobs; they are all important and will help you find that dream job. 1) The job that gets your foot in the door: You may start out with a job that gets your foot in the door that allows you to see that you are going in the wrong direction but you may not have found that out if you hadn’t taken that entry level position after college. Taking a low risk entry-level position is a great way to test the waters and see if this is something that you really want to do. 2) The job that gives you connections: I believe that every job you have is a networking opportunity and I agree 100% that you should never burn a bridge in a job. No matter how much you hate the job or the people you work with you never know what may happen and someday you may need a reference from them or you may decide that you do want to go into that industry. Your best bet is to be professional. Treat people with respect and when you decide to leave follow all of the appropriate procedures to do so and ask if you could use them as a reference sometime. You can never have too many references. 3) The job you were promoted in: I think the article gives a great description of what this job does for you. It is a resume builder and may get you a little bit closer to that dream job. 4) The job you hate: In my opinion there will probably be more than one of these before you get that dream job. Just keep in mind that its not permanent and that it will build your resume or that it is helping you to eliminate a job from the list that you thought you might like. 5) The job you love but leave for something better: I think once you find a job that you really like it is a sure sigh that you are headed in the right direction. Throughout your journey to your dream job you will encounter a variety of all of these jobs. You may only have the five but there is a good chance that you have to go through a few, or a lot, more before you reach that goal. Don’t give up! You will reach the goal eventually and when you do you will be glad that you had enough experience on your resume and some killer references to help you get there. So I hate to admit this but my years here at UMD are quickly coming to an end and once this school year is over the only thing standing between me a grad school will be summer! Three tiny months before I begin the daunting task of graduate school. So to put my mind at ease and to help me make the most of this summer I have done a little research and would like to share what I have found with you. Some of the articles I read had some generic things that most people think of doing but others had some really interesting ideas that I hadn’t thought of. Here is a compiled list of some of the things I plan to do along with some other things as well. 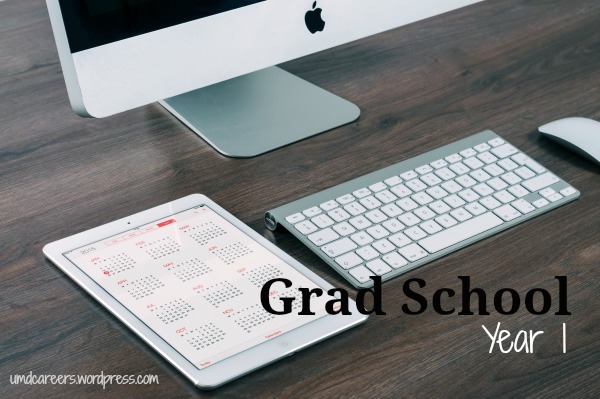 Relax: This is probably obvious and I’m sure that, like me, you have been told many times how stressful grad school is and how busy you will be. So it makes sense that this tip popped up in most of these articles. However, I think, this is a little easier said than done for most people. I mean I am looking forward to grad school but I am also nervous about starting a new program, in a new school and a new city. I know myself well enough to know that I will be thinking about this all summer and it may prevent me from relaxing but I am going to do my best to make sure I push that to the back of my mind and really relax. Get a Summer Job or Internship: This is something that I am really having a hard time with. In my experience, it is always hard to find someone who is willing to hire you just for the summer and once the summer begins I will be a college graduate, which eliminates half of the possibilities. I personally think that looking for an internship would be your best bet and will also give you some good experience for your resume; you may not have the time to take on an internship outside of your grad program after you begin. Travel: Now, personally, I can’t afford to go much of anywhere but for those of you who can, I would take this time and do it. It also may give you some valuable experience before you begin school. Spend Time With Friends and Family: As I mentioned earlier, most people say they don’t have much free time once they start school. 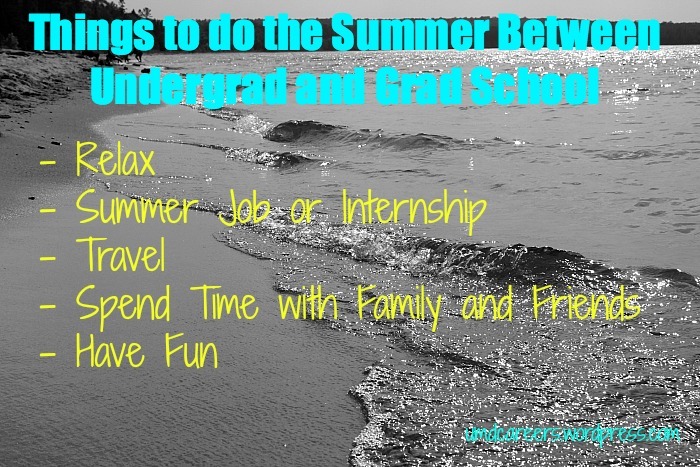 Make the most of this time by spending it with your friends, who got you through your undergrad, or your family because once you start grad school it may seem like you have dropped off the face of the earth. Also warn them that might happen so they are not shocked when you stop returning their calls once your program starts. Have Fun: This can be an number of things from reading to playing video games, watching TV or surfing the internet, or spending time outside. Do what you want to do while you can. Reading and watching TV are some of my favorite things to do and I haven’t really had a whole lot of time for them during school so I plan on doing a ton of it while I do have some time during the summer. Hopefully some of these tips are helpful to you and there are a bunch I left out. Below are links to the articles I found helpful. Note: Here’s another peer’s view on interviewing for graduate programs. You can see Brittany’s take here. Hi everyone. So many of you are aware that I have been in the process of applying to graduate programs in school counseling and psychology. So I just want to share with you some of my experiences going through the interview process. The first thing you need to know is that a grad school interview may be very similar to a job interview but the questions asked are very different. In a job interview you might get questions like: describe a time when you dealt with a frustrated client or when you faced a challenge. So far with my grad school interviews, I have not had those typical questions, which can be good and bad. That can be good in the sense that you get more questions about yourself or why you want to go into a field but it can also be bad in the sense that it is very difficult to prepare. My suggestion for you would be to talk to your career services office and see what resources they can offer to help you. We have Interview Stream and you can meet with a counselor to do a mock interview. Other than that, refresh your memory about the program and about what you included in your application. I had a lot of questions about myself and what kinds of experiences I have had that will help me in my graduate studies. Another thing to know is that there isn’t really a typical format for the interviews. Each school does their own thing and has their own format. Some schools have you interview separately with each member of their faculty and some have group interviews where you and four or five other candidates are interviewed by a few people from their program. If you want to know what to expect, ask the program once you are offered an interview. My recommendation for you, is to be yourself. If you are offered an interview then they know that you are qualified for the program. They want to know if you are a good fit for their program and if you are not being yourself you may end up in a program where you don’t really fit well. If you are like me and you struggle to determine what you should wear to an interview or are convinced that your current wardrobe is lacking in sophistication then here are a few steps you can use to build a basic career wardrobe. Evaluate what you already have: There is no sense in buying a bunch of nice shirts if what you really need is pants. So take the time to go through what you have. Ask yourself if a certain top would look nice under a cardigan or if that dress is long enough to be appropriate for the office. Make Potential Outfits: Lay everything out and then evaluate what outfits you could make with what you have and what potential outfits you could do if you had this or that. Establish what you are lacking before you go on a shopping spree. Focus on the Basics: Now think about a few staples that you may be missing. Things that you could wear with a number of outfits but seem to be missing. You should have some sort of blazer; most go for a basic black that can be paired with almost everything. Comfortable and appropriate footwear is necessary; simple black heels or dress shoes. Along that line you also need the appropriate socks or nylons to go with those shoes. That last one may seem unimportant but it can go along way in ensuring that you look as professional as possible. Get what you NEED: Now that you know what you need it is time to go get them. Focus only on the items that you know you need and try to avoid piling your cart with things that aren’t on your list; so you don’t go broke building a wardrobe for a job you don’t have yet. Try it on: Take the time to make sure that what you buy fits you well. Avoid tops that are too tight or that the neckline falls too low on. Make sure your pants are the right length. It might be helpful to wear those basic heels or dress shoes that you may end up wearing all the time so that you can really see how your pant length looks; it seems silly but it makes a difference. 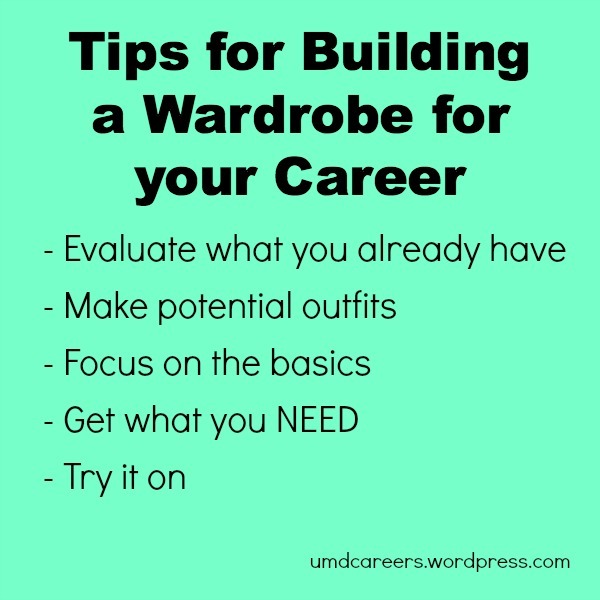 Hopefully you can use these steps to help you create a basic wardrobe for your interviews and your future career! For those of you who, like me, have submitted all of your grad school applications, congratulations! Unfortunately, now we have to play the waiting game while each school picks apart the personal essay that we proofread and rewrote for months, evaluate the kind words our recommenders had for us, and compare our GPAs and test scores to those of the, perhaps, hundreds of other applicants. If you are anything like me, sitting here waiting and not knowing where you will be next year is driving you insane. So I thought I might do a little research on what we can do while we attempt to wait patiently to hear from our schools. 1) Contact your recommenders: Let them know that you have completed your applications and are waiting to hear back and once you do hear from your schools, let them know. Good or bad, they will have words of advice or congratulations to dole out. Be sure to thank them for taking time out of their days to write that recommendation for you. That is a lot of pressure to put on someone. Also they were willing to deal with the slightly crazy version of you that was compiling all of your applications while balancing a million other things. 2) Be patient: I know this may seem obvious, but you have to try. Resist that urge to call the schools every other day. It’s all right to call soon after you have sent your application to ensure that you have turned in all of the required materials, but other than that you just have to wait to hear from them. 3) Research faculty and staff: Get to know the people that you may be learning from in the future. This information may help you make your decision in the end. There are, most likely, a few who have a passion for the same thing that you do and knowing who those people are when you are in an interview could make you stand out. 4) Practice interviewing: If any of the schools you have applied to conduct interviews it is important that you are prepared for them. Contact your school’s career services office as they will have tips for you and may also offer practice interviews. Use the resources that they offer so that when your interview comes around you will be a pro. 5) Relax and focus on graduating: If you are still in college then use that as a distraction from the pins and needles you are currently sitting on. Use your time to study, do homework, or earn some extra dough. Be productive and keep busy if that works for you or take the time to relax, once you start grad school the opportunity to relax may not come along very often so enjoy it while you still can. Hopefully these tips will help you while you play the waiting game. Good luck!